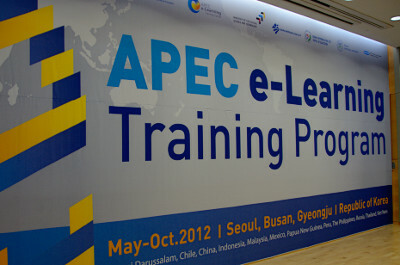 During 14-24 May 2012, I have been appointed to participate in the 23rd APEC e-Learning Training (AeLT) Program by the APEC e-Learning Training Center, and APEC Learning Community Builders (ALCOB). This training is not for everyone. You cannot just pay or register to get training. All trainees must be nominated by the representative of the country. Thanks to many colleagues and friends who nominated. It was very good opportunity for me. 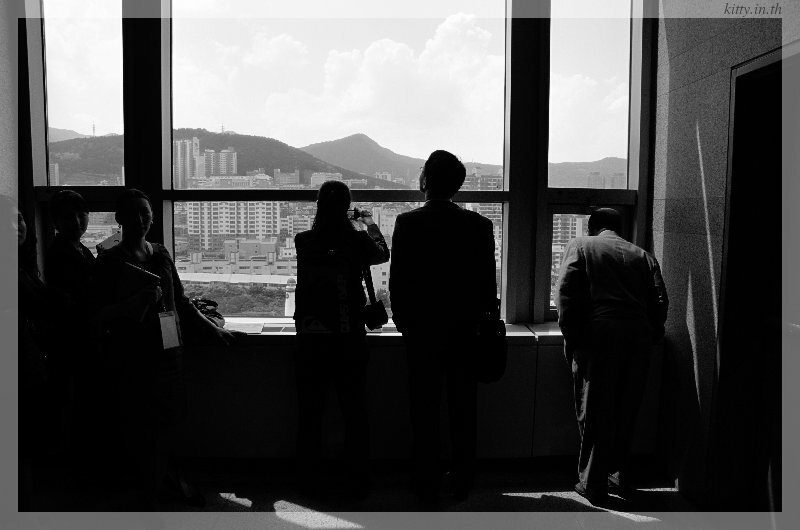 The training was held in Busan and Gyeongju, Republic of Korea. My trip actually started on 13 May 2012, I flew from my hometown – Khon Kaen – to Bangkok, to catch a direct flight to Busan with 2 other trainees from Thailand. The morning of 14th May, I was in Busan. Two volunteers – who later took care us for the whole program – picked us to the hotel. It was a free day, however, it was raining. So, not many activities, just had dinner, then prepared stuffs for the training. In 23rd round of the program, trainees would stayed in Busan for 7 nights, and Gyeongju for 3 more nights. There were were 22 trainees, 5 staffs, and 9 volunteers. All of us were together for the whole program. Trainees from other APEC countries included Brunei, Indonesia, Malaysia, Peru, Sakha, and Vietnam. In the training, we worked as groups. Thailand teamed with two ladies from Sakha. On 15th – 16th, it was training, collaborative studying, homework, then more training, more study, and more homework (- -‘) .. yes, it was serious training and hard working. Well, 20th May was shiny day in Busan. The weather was so nice. The city tour was quite cool, we went to two famous beaches and the APEC house, then ended the trip at a large department store. That night, we all packed our bags and prepared to go to Gyeongju. 21st May, we arrived Gyeongju about noon. Gyeongju was a calm, small, nice, scenic city. We were in Gyeongju to participate in the 5th APEC Education Ministerial Meeting – one of the biggest event in education for APEC countries. I met my good friend – Dr. Vorasuang – here, and, surprisingly, met Dr. Maitree – the Dean of Faculty of Education at Thailand exhibition booth. I was lucky enough that I could attend the keynote by Charles Fadel – the author of one of the most famous 21st century skills book. It was very informative and inspiring. Great ! On 22nd, we attended AEMM subsidiary events, a special lecture by the director of MEST, S. Korea. The training session ended with the interview session. .. Achk ! 23rd May, we went to the field trip in Gyeongju to visit outstanding schools, and finally, back to the hotel for closing ceremony. I had a chance to give a speech, as a representative of the best team project. Actually, I did not know what would happen in the ceremony, but I captured my memories into a note since the field trip in Busan. The note was quite completed. So, it was just to deliver everything I experienced and learned, and gave a short message about my perspective about meeting and leaving. Yes, that night, everyone knew that we would depart. So, we all tried to have a good time together. It was like a never ending photo session. Everyone smiled and smiled and smiled. And, it was great ending for everyone. I did not feel that well actually. I got high pulse rate condition (100+/min at rest, shot to 120+ and dropped to 80- sometimes) for two days. I was tired, cannot eat, cannot sleep. Anyway, that night, I went out for a walk again. Many things crossed my mind, and I did not recover from the pulse rate condition, I could not sleep on the bus. About an hour later, the bus arrived Busan, we dropped some of our friends at the airport. That day, I went to the department store with Thai friends, had lunch, then backed to the hotel. We departed the hotel around 5.30pm to the airport. Our pieces of luggage were 9 kg over-weighted and we had to pay 135,000 KRW for the fine .. Ouch !! All Thai trainees arrived Bangkok at 1am of 25 May. ..11 hrs later. I was at home. The trip ended. Professionally, the training provided many new points of view. It was one of the best trainings I’ve ever attended. 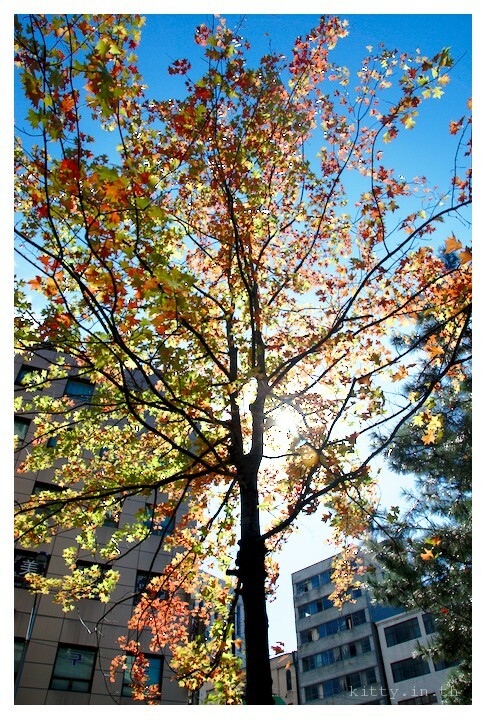 Heh.. come to think of it, the first day I arrived Busan, I really missed my home. Now ? .. My god, I miss my friends. I miss everything and everyone in Korea.